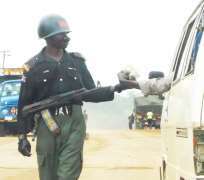 The Commissioner of Police in Lagos State, Imohimi Edgal, said on Thursday that nine policemen, one traffic warden and two others have been arrested for extorting money from motorists. Edgal told journalists the arrest was a follow up to his warning to officers and men of the state police command to guide against corruption and unprofessional conducts. He said the X-Squad unit had intensified its activities to ensure zero tolerance to corruption and unruly practices by police officers and men of the command. Edgal said, “In the light of this, operatives of the X-Squad have been out day and night to ensure that this renewed determination is achieved. “To this effect, nine policemen and a senior traffic warden alongside two of their accomplices popularly known as ‘Camp Boys’ or ‘Antelopes’ were arrested between September 1 and 18, 2017. “One of the Camp boys identified as Taofik Ismaila was arrested along Ikotun road on September 8, along with some unscrupulous policemen, who were caught extorting money from innocent motorists. “Similarly, the unit also arrested one Stephen Nwafor along Igando road with some policemen caught collecting money from some unsuspecting motorists. The police commissioner has also directed that the Divisional Police Officers (DPOs) and the Divisional Traffic officers of the affected areas be issued queries for lack of supervision and disobedience to lawful orders. He urged all executives and members of the National Union of Road Transport Workers (NURTW) to warn their members from being used by unscrupulous policemen as tools and agents of extortion against members of the public. “The activities of this unit are still on and will not relax until the command gets rid of all the bad elements,” he added.